The topic of censorship is a tricky one because I have my own personal views which, basically, can be summed up like this: I think people should be able to read whatever in the heck they want…and that includes teenagers. I am a parent and I have teenagers who love to read. My son read Donna Tartt’s The Secret History when he was barely 14. Is there adult content, sure. Could we talk about it – absolutely. The Canadian Organization, Freedom to Read has a comprehensive (and honestly, funny,) timeline of books that have been banned dating back to 259-210 B.C. It’s amazing what’s on that list – everything from Shakespeare (1788: Shakespeare’s King Lear was banned from the stage until 1820 — in deference to the insanity of the reigning monarch, King George III.) to Beatrix Potter’s Peter Rabbit books (1980s: During its examination of school learning materials, the London County Council in England banned the use of Beatrix Potter’s children’s classics The Tale of Peter Rabbit and Benjamin Bunny from all London schools. The reason: the stories portrayed only “middle-class rabbits.”) And here’s one of my favourites: 1983: Members of the Alabama State Textbook Committee called for the rejection of The Diary of Anne Frank because it was “a real downer.” It was also challenged for offensive references to sexuality. This is a National Book Award winner and I read it a couple years ago. Here’s the funny thing – acclaimed books, award winning books often make the banned books list as well. This novel is, in part, based on the author’s own experiences growing up. It’s the story of Arnold ‘Junior’ Spirit, a fourteen year old Native American who lives on’ the rez’. He’s got a whole host of physical problems, ten teeth too many and a head that’s too big. He’s picked on a lot and says he’s a member of the “Black Eye of the Month Club.” But he’s funny and smart and it is almost impossible not to fall in love with him. 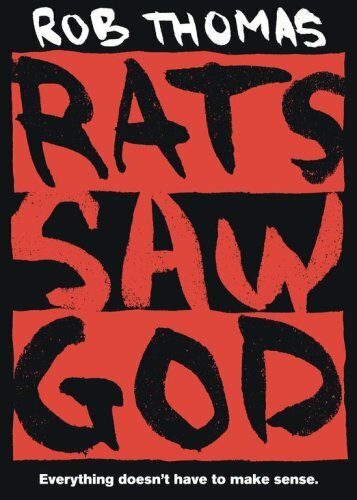 So, this book has been banned in multiple school districts in the States for being vulgar, making references to masturbation and using inappropriate language. Personally, I didn’t find it objectionable and I often recommend it to boys who aren’t particularly enthusiastic readers because it’s straight – up funny and also because Junior is an aspiring artist, it’s filled with drawings and doodles. I haven’t had a single kid tell me they didn’t like it. This book is about a high school senior called Steve York who is pretty close to flunking out of school despite the fact that he’s super smart. 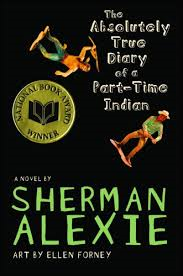 This book was challenged because Steve smokes drugs, but the book hardly endorses drug use – it’s actually very much a coming of age story a la Catcher in the Rye (another books that has been challenged multiple times.) Anyway, Steve’s guidance counselor gives him one last chance to save his year- he has to write a 100 page paper about…anything…and ultimately Steve uses the writing to work through his issues. Clever book, terrific main character….positive messages for struggling teens. So this was Ms. Rowell’s first novel and it caused a huge splash when it was published – partly because John Green wrote a glowing review and partly because it’s awesome – but it’s also been called “dangerously obscene” – which it is certainly not, unless maybe you don’t like 80s new wave music. 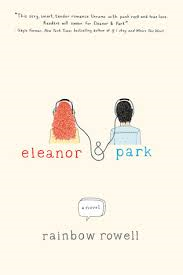 Eleanor is an awkward teenager who lives with her mother and step-father (who is a creep) and her younger siblings and Park is half Korean and comes from a stable, loving home and this novel is about friendship and love. This entry was posted in On the Radio and tagged 2015, banned books, CBC by Christie. Bookmark the permalink.